Meadow Farm Hydrotherapy was established by Rachel Watkins in 2000 to offer hydrotherapy facilities as an aid in the recovery and rehabilitation of injured animals, primarily dogs. Since then the centre has expanded to give an all round service of care which includes Acupuncture, McTimoney Therapy, Physiotherapy, Companion Animal Behaviour Therapy, Grooming, general pet advice and holistic care. Rachel initially trained at Warwick Agricultural College studying Equine Studies and Sports Therapy, then completed further training at The Hawksmoor Hydrotherapy Training Centre gaining a Certificate in Hydrotherapy for Small Animals and a Hawksmoor Student of The Year Award. This qualification gained national accreditation in 2010 and is now a compulsory requirement for membership of The Canine Hydrotherapy Association (CHA). Rachel has also studied with COAPE (The Centre Of Applied Pet Ethology) she holds a Diploma in Companion Animal Behaviour and Training and is a member of CAPBT (The Coape Association of Pet Behaviour Therapists). This allows Meadow Farm to offer a unique hydrotherapy service, not offered by other centres within Norfolk and Suffolk. Animals undergoing hydrotherapy treatment are assessed with regards to emotion and mood state, ensuring that all treatment brings minimal stress and that the long term mental welfare of injured animals is addressed with clients, where necessary. Many young dogs express boisterous behaviour that can jeopardise both their short term recovery post surgery and long term physical welfare, we are experienced in helping and guiding clients in the most appropriate ways to tackle these issues if required. Rachel was an active board member of the CHA between 2010 and 2015 and held the post of Company Secretary between 2013 and 2015. The CHA is the leading governing body of small animal hydrotherapy and Rachel was instrumental in bringing the first national qualification in small animal hydrotherapy to the forefront of CHA Quality Standards along with centre inspections. The CHA now requires at least one staff member to complete qualifications on the Qualification and Credit Framework (QCF) and completes centre audits for all prospective members before membership is granted . Rachel is still committed to improving standards within the hydrotherapy industry, by providing hydrotherapy training for physiotherapy students, hydrotherapists, veterinary practitioners and other therapists who attend practical training days at Meadow Farm. In 2015 Rachel also gained the Pearson BTEC Certificate in Education and Training (CET) and is looking forward, during 2016, to establishing quality CPD training for practitioners, alongside seminars and workshops for clients. 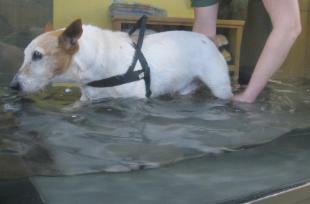 In 1999 after nine years working within a variety of aspects of small animal veterinary practice, Rachel was drawn towards canine hydrotherapy. "The idea started when my mother had a Cavalier puppy, Beatie, born with the umbilical cord wrapped around her front leg. Her leg was underdeveloped, having very little muscle and was shorter than the other front limb. She underwent an operation to help lengthen and straighten the leg and later started swimming at a local canine pool, to help build up the muscle and strengthen the leg. I spent some time with the pool operator and he very patiently taught me about the technicalities of swimming dogs, and of pool construction". 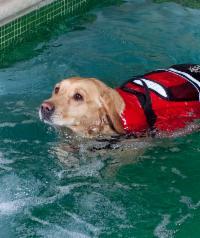 "By the time I had decided to open my own hydrotherapy centre, I knew exactly what I wanted. My husband Roger joined me in the venture and we ended up building our own concrete tiled pool, as those pre-manufactured at the time didn't provide what we felt we needed. With the help of an experienced swimming pool company we designed and built our pool from scratch. "Beatie, my mother's dog, did amazingly well! Her confidence grew as she became stronger and she learnt she could keep up with her house mates; this is something we see with many of the dogs we treat; their behaviour patterns change. Owners who think their puppies normal behaviour is quiet and subdued, gradually see changes, their puppies become bright, bubbly and often naughty. Dogs that owners think are just "growing old" and slowing up, gain strength and energy. This mental response is due to several factors, the physical effects of exercising in water, reducing pain, increasing strength and range of motion and a generalised increased mood state. Since we first opened in 2000 the hydrotherapy industry has progressed rapidly offering new techniques and equipment, the hydrotherapy service at Meadow Farm has progressed along with the industry changes, four additional therapists have joined the Meadow Farm team and new facilities and services have been developed. All our therapist attend Continuing Professional Development (CPD) training to ensure that they remain up to date with current research and treatment methods. In 2002 my vet referred me to Peggy Sofley PG Dip.AM. EBW, McTimoney therapist. Peggy's treatments worked well for my cavalier Kelly and as a result I asked Peggy to join us to treat dogs that came to us for hydrotherapy and so the services we offered expanded. For a long time we had appreciated the benefits that physiotherapy treatment could provide for many of the dogs that were visiting us for hydrotherapy and in 2006 we launched a physiotherapy service that is now at the forefront of our rehabilitation programmes. We were also aware that acupuncture would be of great benefit to many of the dogs that were referred to us and early in 2007 Roberta Baxter MA VetMB MRCVS came to work with us and run her pain therapy clinics from our facilities. Roberta completed the team and we now have a fantastic group of therapists that work closely together with you and your vet, to offer a holistic treatment plan for all your varied animal friends. In April 2008 we built an new facility to expand the already sort after hydrotherapy service we offered. This new facility provided us with room for our Hydrophysio HP 300 Aquatic Treadmill, a spacious fully equipped physiotherapy room, new offices, reception, pet shop and training room. The Hydrophysio Aquatic Treadmill is at the forefront of our hydrotherapy service and is now the only hydrotherapy treatment that we offer. After 15 years of working within the hydrotherapy industry we believe that Aquatic Treadmill therapy provides more flexibility, control, safety, therapeutic and behavioural benefits than swimming. Aquatic treadmill therapy is often the preferred treatment chosen by orthopaedic and neurological surgeons. We invite you to visit us for an informal chat before booking your pets in for their first appointment. This gives you a chance to look at our facilities, watch some dogs in the Aquatic Treadmill and talk to existing clients and various therapists. We can then contact your veterinary surgeon on your behalf to organise a referral, if you wish. This allows your vet to discuss your pets case history with us personally and to forward all the relevant paperwork that we need. 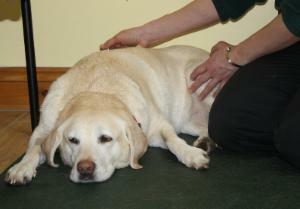 We are only able to carry out treatment for your pet after a formal veterinary referral has been received. You can download our veterinary referral form here. All assessments are carried out by a fully qualified Veterinary Physiotherapist who oversees the treatment programmes and carries out regular reviews for all our patients. We allow as much time as is necessary with your pet introducing them to our surroundings gradually, making sure that treatment is as enjoyable as it is therapeutic. We are committed to providing a friendly, professional one to one service at affordable prices, Meadow Farm is a dedicated centre specialising in rehabilitation alone.